Identifying the etiology of a patient's primary headache may help determine the best treatment option. Chronic daily headache (CDH) has been found to affect 2 to 4% of North American and European populations.1 CDH is not a specific type of headache (HA), rather, it is an umbrella term for several different and specific diagnoses that are characterized by frequent HAs. Treating CDH can be challenging for clinicians since HA is often an “invisible disorder” that does not have objective measures. In addition, finding optimal treatment often requires experimentation with different medication options over several weeks or months. A recent article by Sheeler et al outlined a 10-step program to assist clinicians in diagnosing and treating CDH, which is summarized in Figure 1. In step 1 of the program, the provider should identify any underlying condition that could potentially be the primary cause of a patient’s HA.1 Although most patients do not need further testing, it is important to recognize which patients may need additional follow-up. Patients who require additional follow-up are listed in Figure 1. The key conditions that a clinician should aim to exclude while assessing a patient are vascular, infectious, and neoplastic disorders. Step 2 involves classification of a patient’s primary HA disorder. In their article, Sheeler et al focused on the subtypes of primary daily HA that last ≥4 hours per day on ≥15 days per month. 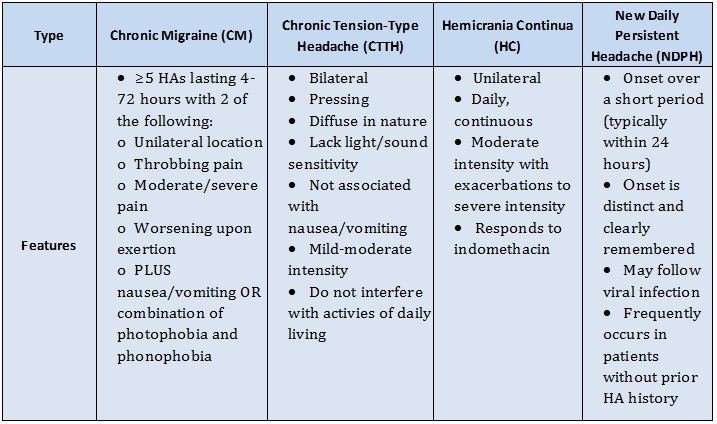 These subtypes are chronic migraine (CM), chronic tension-type headache (CTTH), hemicrania continua (HC), and new daily persistent headache (NDPH). CM and CTTH have been found to account for approximately 98% of CDH cases. Table 1 describes the features associated with each subtype of CDH. It is important to identify the etiology of a patient’s primary HA because it may dictate the best treatment option for that specific patient. In step 3 of the 10-step program devised by Sheeler et al, exacerbating or sustaining factors affecting a patient’s HA should be identified.1 In addition to the exacerbating factors listed in Figure 1, it is wise to review a patient’s medication list to determine if any drugs could be worsening the patient’s condition. Step 4 of the program involves identifying a patient’s comorbid disorders. Although treating a comorbid disorder may not alleviate a patient’s HA problem, it is important to recognize other disorders since it may be possible to tailor therapy to treat both conditions. In step 5, a clinician should assess a patient’s current acute therapy. It is important to identify which medications the patient has used in the past, as well as current medications a patient is taking. It may be valuable to create a table detailing a patient’s HA care. 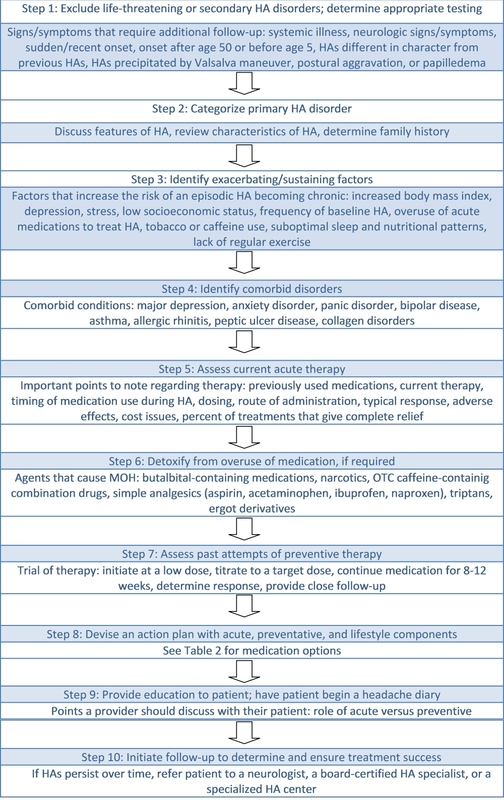 Step 6 of the 10-step program for diagnosis and treatment of CDH involves creating a plan to detoxify a patient from medication overuse, if necessary.1 Detoxification has proven successful in some patients, and can lead to decreased HA frequency and improved response to acute and preventive medications. Since virtually all of the acute medications used to treat HA can lead to medication overuse headache (MOH), it is important to identify potentially causative agents, the duration of therapy, and maximum dosages used. Figure 1 lists medications known to cause MOH. It is recommended to begin a preventive agent while discontinuing the offending medication. Since many patients will experience transient exacerbations of HA during detoxification, adjunctive treatments such as a short-course of corticosteroids, dihydroergotamine regimens, nonsteroidal anti-inflammatory drugs (NSAIDs), and occipital nerve blocks can be used to provide relief. Inpatient treatment may be required for withdrawal from barbiturate or narcotic therapies. In step 7 of the program, a clinician should examine a patient’s medication history to assess past preventive attempts.1 Since preventive therapy is the mainstay in the treatment of CDH, it is important to determine which therapies have not been successful in the past to ensure finding an option that is best for a patient. Unfortunately, there is no specific way to determine which medication will be most effective for a patient (with the exception of HC, which responds solely to indomethacin), therefore trials of various medications are often required. Step 8 of the program involves the creation of an action plan that addresses preventive, acute, and lifestyle components of CDH therapy.1 Table 2 lists medications used in the treatment of CDH. Preventive therapy, which is the cornerstone of CDH treatment, is used to decrease HA frequency and/or intensity. Success of preventive therapy is considered at least a 50% reduction in HAs or a 50% decrease in HA intensity. Acute therapy typically includes a combination of over-the-counter medicines plus more targeted pharmacotherapy. Targeted pharmacotherapy is used more in patients who suffer from migraines that are responsive to the medications used. To prevent MOH, simple analgesics should be used <14 days per month and targeted pharmacotherapy should be used <10 days per month. An additional factor to consider when treating CDH is the route of administration of an agent. Intranasal, injectable, or oral acute medications provide a faster onset compared to other medications and can be utilized for patients who suffer from sudden exacerbations of HAs. Lifestyle changes should also be initiated in a patient diagnosed with CDH. These modifications include routine exercise, stress management, behavioral therapy and counseling, avoidance of triggers, optimizing sleep patterns, and maintaining balanced meals. In step 9 of the program, education regarding treatment should be provided.1 Teaching patients about their condition and setting realistic goals is an important step within this program. Points that should be discussed with a patient are listed in Figure 1. It is also recommended that a patient begin a headache diary, which should be maintained on a daily basis with details about headache days, treatment use, and treatment response and reviewed at every visit with the provider. The final step of the program involves initiation of follow-up for continuous patient improvement. It is important for clinicians to work closely with their patients to ensure treatment success over time. CDH is a condition that can lead to functional impairment and a decrease in quality of life. Since CDH can often be difficult to treat, Sheeler et al recently published a 10-step program to assist clinicians in diagnosing and managing CDH.